Reduce the burden of obesity and related diseases through research, methods development, capacity building, and knowledge exchange on policy actions for creating healthy, sustainable, equitable food systems and reversing obesogenic environments. The CRE brought together a multi-disciplinary research team that aimed to have a real impact on the successful implementation of potent and sustainable obesity prevention policy actions across a range of sectors. 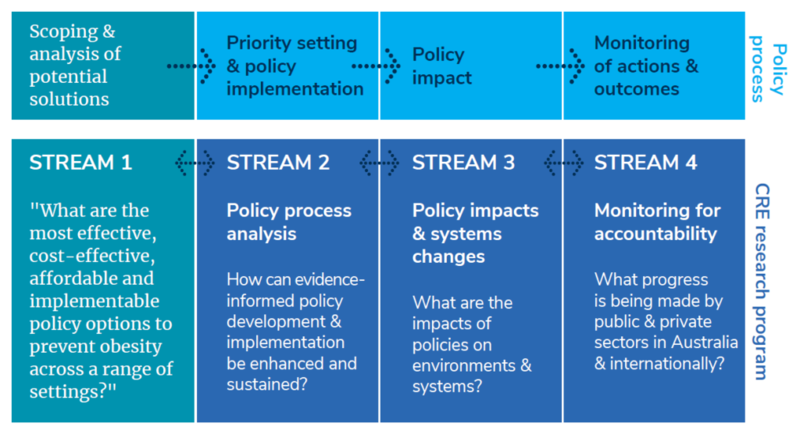 An overarching policy process (from problem analysis, through policy formulation and implementation, to long-term monitoring of actions and outcomes) was employed as the basis for structuring the research program. In the years prior to the grant, the team had already undertaken extensive, systematic research in the ‘problem analysis and solution identification’ part of the policy process. This created the platforms for each of the four research streams.